VHD, short for Virtual Hard Drive, is a format developed by Microsoft for their virtualization platforms. Often, VHD/VHDX files come from virtual machines created by Hyper-V, a native hypervisor from Microsoft. ReclaiMe Pro supports VHD and VHDX disk image formats. To load a VHD/VHDX file to ReclaiMe Pro, use the Add image button. There are three types of virtual hard disks: fixed, dynamic, and differencing. A VHD/VHDX file of a fixed virtual hard disk has the size specified at the time of file creation. Amount of data stored on a fixed virtual disk may differ from the actual hard disk size. The size of a dynamic virtual hard disk is about the amount of data stored on it. The claimed disk size may be much larger. A differencing virtual hard disk is a hard disk, which is based on another virtual hard disk, so called a parent disk. 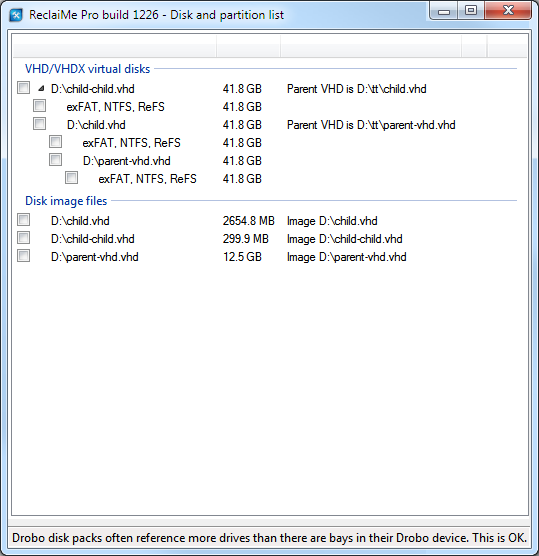 A parent disk image file can be any of the virtual hard disk types: fixed, dynamic or differencing. The size of a differencing file corresponds to the amount of data stored on it. To open a differencing hard disk file correctly, all the members of the parent-children chain should be available. If some of the members are missing, ReclaiMe Pro still opens the chain so that you can at least recover data stored on the available disks. If the name of a virtual hard disk is red in ReclaiMe Pro, it means that some files in the parent-children chain are missing. The name of the parent for each differencing virtual hard disk is listed in the column next to the column displaying the disk file name. ReclaiMe Pro can open VHD and VHDX files of any type.